Miami new construction is on a roll with so many properties coming up in different parts of the city as well as the Bayfront area. Real estate professionals often say that the Miami Bayfront is booming! And what a great place to be…the Miami Bayfront features amazingly breathtaking views of Biscayne Bay, South Beach and the Miami skyline. One of the best parts of living here is being so close to Bayfront Park. If there is not an event going on, it is just a nice place to spend some time outside getting your daily dose of Vitamin D. A really cool event coming up next weekend is the Ultra Music Festival. Over the three days – March 28-30, the world’s most famous DJ’s come together at one of the largest electronic music festivals in the world. This is a fantastic event for anyone who loves music and loves to dance with several popular Miami DJs performing. Bayfront Park is one of the best parts of Miami. This large park features a large amphitheater and a large park and pavilion. In addition to simply enjoying the tropical landscaping, there are free yoga classes, a trapeze school, a huge playground and so much more. Midtown and Downtown Miami are the closest neighborhoods around Bayfront Park. These neighborhoods are well known for their beautiful and luxury condominiums. Several of them feature residences that look over Bayfront Park and Biscayne Bay. An up and coming neighborhood, Edgewater , is situated just north of Bayfront Park and is undergoing a major overhaul turning it from a rundown and avoided part of Miami into a neighborhood where people are beginning to flock. Developers like The Related Group see the potential in Edgewater and have begun to develop major projects along the water. Whether a new condominium or one that has been around for a while, there are lots of options to living near Bayfront Park. Several are within walking distance to the park and offer lots of amenities to make living in Miami like living on vacation all the time. Here are some of the closest condominiums to Bayfront Park as well as others along the water that are worth mentioning. One Miami. 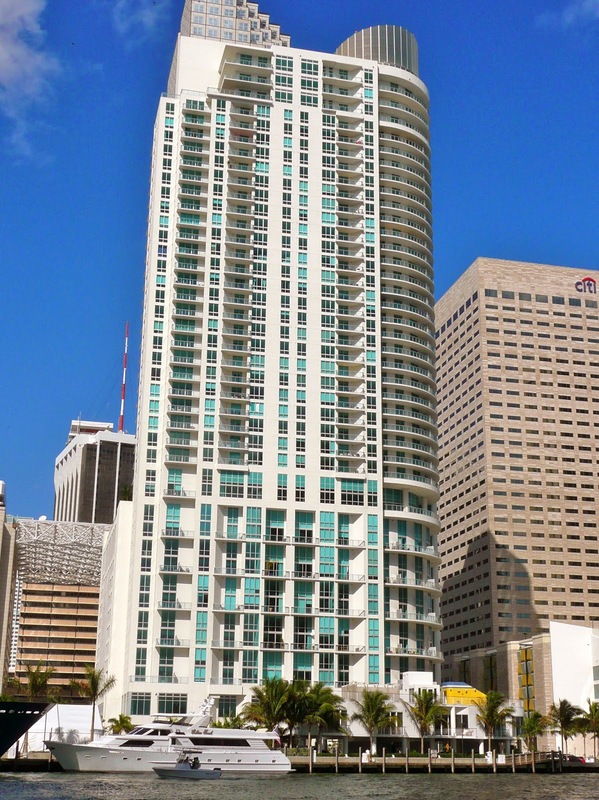 Located at 325 South Biscayne Boulevard, One Miami is a two-tower condominium with almost 900 residences. It was developed by the Related Group with help in the architectural design by Arquitectonica. Amenities include a resort-style pool, 24-hour valet and concierge, 24-hour security with gated entry, common rooms for entertaining and meetings, and so much more. There are studios, penthouses, one bedroom, two and three bedrooms ranging in size from 507 to 3208 square feet. List prices typically fall between the mid-$200s and the mid-$800s with units taking about 150 days to sell. In terms of rentals, there are always units for rent with monthly rates ranging from about $1,700 for a studio to over $3,500 for a three-bedroom unit. For those interested, there are fully furnished units as well as unfurnished available. This is an excellent option for Miami real estate investors. 50 Biscayne. 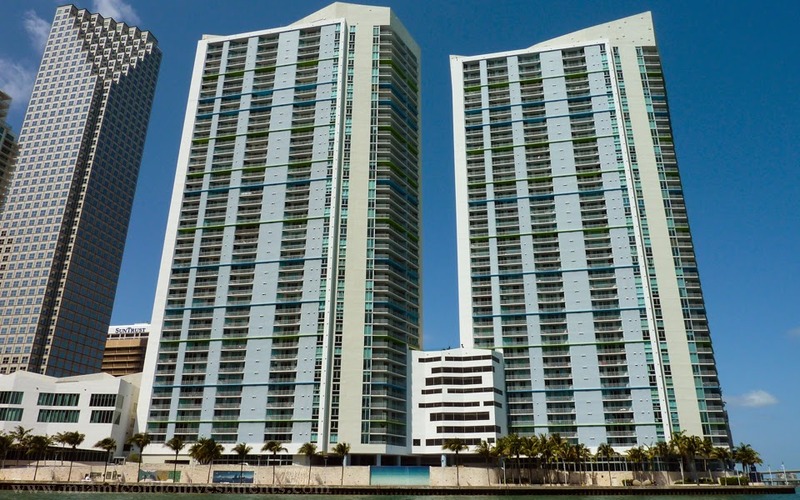 This Related Group condominium sits directly across from Bayfront Park and features a very creative and unique architectural style by Sieger Suarez. Built in 2005, it is a 54-story building with 523 units all spread over the building. It offers a three-story ground floor with retail/commercial space, a state-of-the-art fitness center, large pool and so much more. Units feature continuous glass balconies, floor to ceiling windows, gourmet kitchens and more. List prices at 50 Biscayne start in the low to mid-$200s and climb to about $1 million with the average number of days on the market at about 160 days. In terms of rentals, monthly rental rates ranging from 567 to almost 2,000 square feet. Met 1 Miami. Situated on Biscayne Bay, Met 1 is just a few short blocks from Bayfront Park (no parking issues for the Ultra Music Festival!) and faces the point where the Miami River flows into Biscayne Bay. This is a beautiful condominium with lots of character in its design. It consists of 447 residences comprised of lofts, tower suites and penthouses with one to three bedrooms. List prices for Met 1 condominium properties typically range between the low to mid-$200s and upper-$900s taking about 120 days to sell. As for rentals, monthly rates go from about $1,700 to almost $8,000 for a larger upper-floor, three-bedroom unit. There are lots amenities inside each unit as well as throughout the condominium. Just north of Bayfront Park and the Midtown neighborhood is Edgewater. This up and coming neighborhood is beginning to take Miami by storm. Developers have begun to buy up land and lay the groundwork for new condominiums as well as retail and commercial space throughout the area. The Related Group has several major projects in the works that will give Edgewater its claim to fame. Paraiso Bay. In Spanish, Paraiso means paradise and that is what Paraiso Bay is destined to be. It will be set on five acres that will include a beautiful new park designed for the public in exchange for the city allowing one of the streets to be permanently closed off. 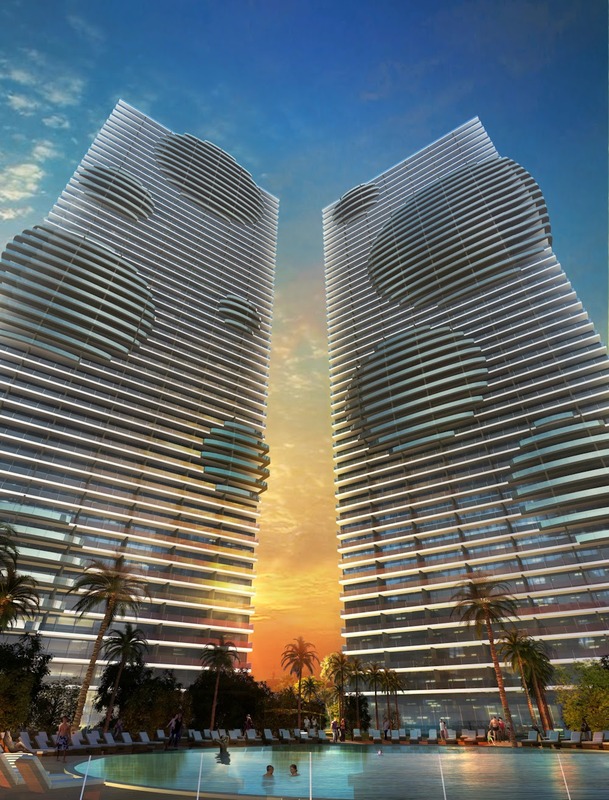 Paraiso Bay will consist of two 55-story towers housing approximately (345) one, two, three and four-bedroom units ranging in size from about 1,000 square feet to about 2,500 square feet. All of the residences have gorgeous bay views as there are only a maximum of seven units on each floor lined up across the building. While much of the building is sold out, list prices range from the upper-$300s to well over $1 million. Rentals are yet to be determined as the property is under construction. Icon Bay. Another Related Group project under construction in Edgewater is Icon Bay. It features 40 stories with 300 units and a grand three-story lobby that will showcase the fabulous artwork that is a passion of Jorge Perez. Each floor will house only eight units consisting of one, two and three bedroom residences with bay views. Sizes range from slightly more than 900 square feet to over 1500 square feet (penthouses are over 2,000 square feet). Each residence is contemporary in its design and amenities with the common areas featuring the same unique look and tons of bells and whistles. Completion is expected in Spring 2015 with the majority of the building sold out. With so much going on in terms of Miami real estate developments in and around Bayfront Park, it is no wonder that the park is such a popular area for major events. 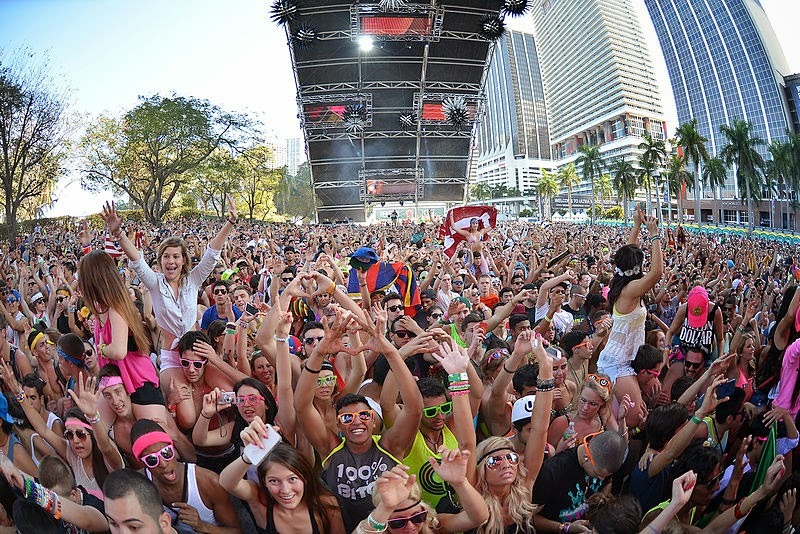 It is events like the Ultra Music Festival that bring so many people to the area allowing them to see what Miami is all about and how fabulous it is to live here. There is no place like it and nowhere else a lot of people want to be.